COMPETITION: ABS11 Blacklight Bouldering - NEW!! OPEN CLIMB: Blacklight Bouldering - NEW!! 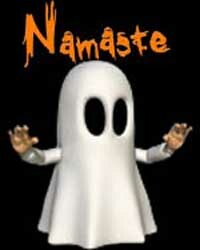 YOGA: Costume Yoga - NEW!! 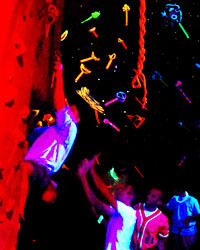 Check out the ridiculousness that is blacklight climbing. Blacklight Bouldering!!!! Bright colors and glowing holds create a unique vibe that’s not to be missed. 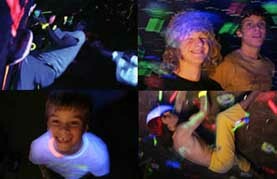 Wear white or flourescent; we have 2200 watts of blacklight to make you glow! All ages and abilities are welcome. What does Edgeworks, a chicken suit, and Ardha Chandrasana all have in common? COSTUME YOGA!!!! Spooky fun yoga in costume! All levels welcome! Come in costume, if you don’t have one, we have one for you. See you there! 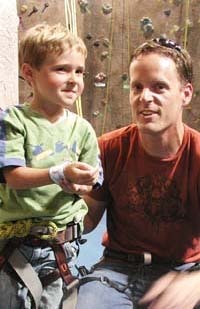 If you want to start leading sport climbs outside, we suggest you start by learning some essential skills indoors. 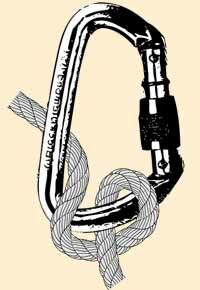 Our expert instructors will teach you how to go to any sport crag in the country so you can lead, set and clean anchors. 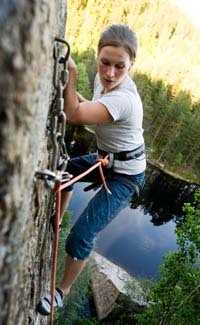 Climbing outside is beautiful and exciting when done safely.